How many words do you need to learn in order to speak English fluently? Well, it depends on what you mean by "fluent". We looked at a "word frequency" list of spoken English - a list of which words show up most often - and made some interesting discoveries. On one hand, learning English is actually kind of easy. 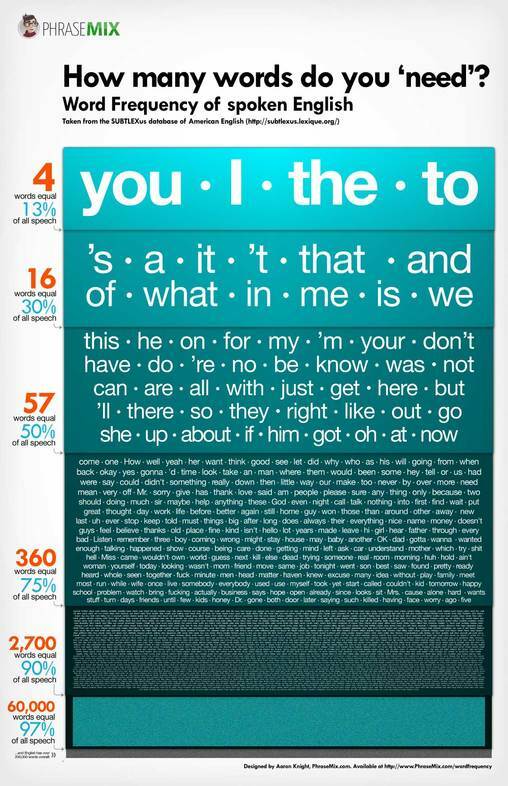 It turns out that just 4 words (you, I, the, and to) make up about 13% of all English speech. You know those words, right? Congratulations! If you learn just 12 more words (words like a, it, and, what, and is), you'll have covered a full 30%. And learning only 360 words will cover 75% of spoken English. These are all words that you already know! They include words like coming, wrong, tomorrow, and make. To understand to 97%, you'll need to know up to 60,000 words! Something else to consider is that those last 25% of words are much more rare than the first 25%. So you won't have as many chances to hear them and learn them. If you want to become a fluent English speaker, it's clear that you should work to become stronger with those core words. Even though you know what all of the simple English words mean, you can still practice to become better at using them. One way to do that is by learning phrases that combine simple, common words with ones that are less common. As for all of the other words, just learn them as you come across them. For example, f you're buying a home, learn words and phrases related to real estate, loans, and construction. If you're interested in music, learn how to talk about the kind of music you like. You can see a break-down of the word frequencies in the infographic below. It uses information from the SubtlexUS American Word Frequency list at http://subtlexus.lexique.org/. This is data taken from subtitles, so it matches spoken English patterns. You'll see how few words you really need to understand the majority of English, and how many you need to understand the rest of it. Click on the image below to download a printable 11x17" PDF.